However, GCC, shortly thereafter, got in trouble with Atari for their Missile Command hack. They lost the ensuing lawsuit (and interestingly enough, the settlement was that GCC would make two new games for Atari, which became the games Food Fight and Quantum), and to avoid future legal issues, they looked to sell off the Crazy Otto game as well. Midway, who had seen the Crazy Otto advertisement in Time, and, as mentioned, feeling impatient over the slow development of the Pac-Man sequel, were the ones who bought Crazy Otto. 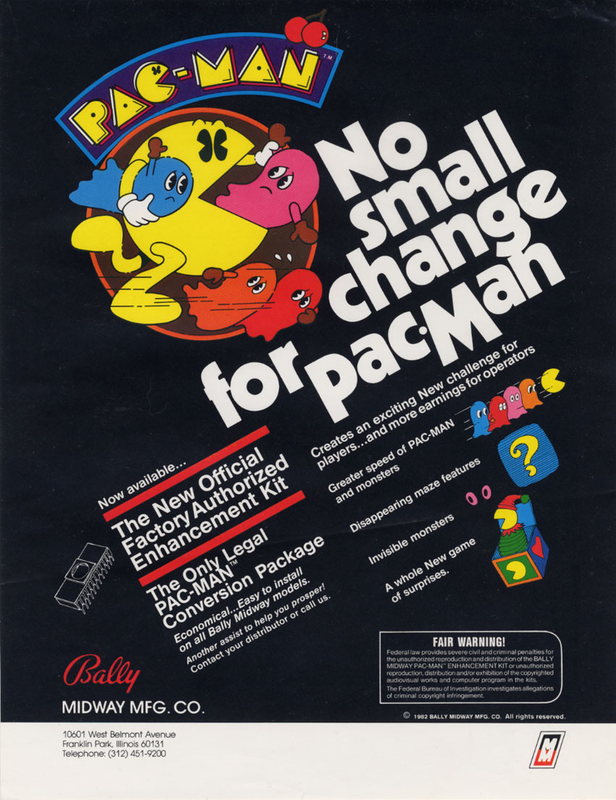 After converting some of the graphics, Midway, without consent from Namco, released it as their own sequel to Pac-Man in January of 1982, known as Ms. Pac-Man. Namco, to say the least, was not happy. And, as it was for me, it might be quite the surprise to you to find out that Ms. Pac-Man, which has become such a beloved game, and often considered the superior version to the original Pac-Man, is actually an illegal hacked version of Pac-Man! Talk about ruined childhoods and everything you know being a lie. And, as mentioned earlier, Super Pac-Man went on to be released in October 1982, where it met mild success. It never reached anywhere near the popularity of Ms. Pac-Man. If that's not irony, I don't know what is. But this was only the start of many illegally released Pac-Man games by Midway without the consent of Namco, eventually leading to the termination of their license to make the arcade cabinets for Namco in 1984, after making a game called Professor Pac-Man. The first of these, though, was Pac-Man Plus, released between Ms. Pac-Man and Super Pac-Man in the summer of 1982. I mention this one just as an example of the lengths Midway went to on their unlicensed Pac-Man games. They, quite interestingly, went out of their way to emphasize that it was "Official" and the "Only Legal Pac-Man Conversion Kit". These, of course, are blatant lies! Pac-Man Plus itself is a very strange version of Pac-Man, certainly not as polished and nice as Ms. Pac-Man was. Mostly what it did was arbitrarily change some graphics (when the ghosts turn blue, they now sprout leaves from their head? ), and add in various "challenges" to make the game more interesting for experienced players. Really, it just made it more confusing and weird. The power pellets don't always do the same thing (ghosts sometimes turn invisble, sometimes not all the ghosts turn blue, or the maze itself becomes invisible), making it impossible to use patterns. All in all, compared to Ms. Pac-Man, it wasn't very good, and is largely forgotten. As for the rest of Pac-Man's family members, their history is as follows. Following Ms. Pac-Man and its unbridled success, Midway asked GCC to develop another Pac-Man game for them, this time becoming Jr. Pac-Man. It was released in the following year of 1983, and once again, it did not find anything near the success of Pac-Man or Ms. Pac-Man. It was, at least, definitely an improvement over Pac-Man Plus, actually bringing some nice new changes. The mazes were bigger, with added camera scrolling, as well as adding a new mechanic for the bonus items. A few months prior to this, in the same month that Super Pac-Man was released, to be specific, Midway also released the game Baby Pac-Man, which was a combination pinball game and video game. Quite interesting, but still illegal, and still never found popularity (likely due to a rather limited production of only 7000 arcade units of the game). And there you have it, that's the entirety of Pac-Man's unlicensed family! So what became of them? Well, sometime after they terminated their license agreement with Midway, Namco "appropriated" all of these characters. And under ownership by Namco, some of these characters, let's just say, fared better than others. Of these, Ms. Pac-Man fared the best, recieving various ports to different game consoles and mobile devices (and even a reproduction arcade cabinet that included it alongside Galaga), and even her own new game, Ms. Pac-Man Maze Madness. And this time, all officially lisenced by Namco! However, despite this, Namco has always refused to acknowledge the existence of the game in all anniversary and "history of Pac-Man" types of material. She went for a long time without any appearance in any new games, until she was a small cameo in Super Smash Bros. for Wii U. As for Baby Pac-Man and Jr. Pac-Man, they really got the short end of the stick. 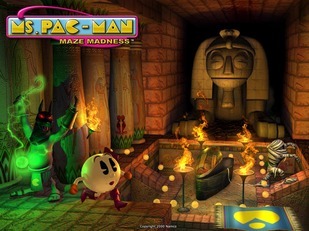 Baby Pac-Man appeared in a whole three more games, with only one as a playable appearance - in the not-particularly-liked multiplayer mode of Ms. Pac-Man Maze Madness. No ports for Baby Pac-Man (which is at least understandable because of its nature as a video game pinball machine hybrid). Baby Pac-Man's final appearance was in the Wii version of Pac 'n Roll in 2007, under the name of Pac-Baby. Jr.'s appearance in Pac-Man World Rally. Jr. Pac-Man made a few more appearances, but was never anything more than a background character, serving as not much more than a plot device at best (such as in Pac-Man 2: The New Adventures), and nothing but a cameo at worst (such as in Pac-Man World 2 and Pac-Man World 3). His game has never recieved any ports outside of those made when he was still owned by Midway (it's on things like the Commodore 64). His only playable appearance since his original game was in Pac-Man World Rally from 2006, which was also his last appearance altogether - that's going on ten years since Jr. Pac-Man has seen the light of day. Another interesting side note about Pac-Man World Rally: there is one Pac-character they added just for that game that has also never been seen since. And that would be Pac-Devil, a red, horned, fanged, and tailed Pac-Man lookalike. For whatever reason, they made him just to be a character in this game, and then, never used him again. I thought for sure he came from something else first, but no. He is now something of an odd side note in the Pac-Man series. Pac-Man's new design and his new companions. Since then, Pac-Man has gone through something of a redesign, and along with his new show, Pac-Man and the Ghostly Adventures, has come a new series of games with a new cast of friends and family for him. Aside from his recent appearance in his old Pac-Man World, early-2000's design in Super Smash Bros., it seems as though that era of Pac-Man's history has been put behind him now for good. And so it seems, without so much as a goodbye, so much as an acknowledgement, those characters who had their beginnings in the illegal, unlicensed games were discarded. Namco made them all into minor background characters (aside from Ms. Pac-Man, in one case), none of them ever did much of anything, and then they were discontinued and later replaced. A fitting punishment. Though it does make me a bit sad, as I grew up in the era when those characters and designs were what was being used. Without going so far as to say those designs and characters should never have been abandoned, it would at least have been nice if they had survived the redesign! And that, as they say, is that. I really enjoy this story because, really, there's nothing else out there quite like it! I'd also never seen it all together in one article before, I got all of this here in snippets from reading about the individual games, and a bit of personal experience. Did any of this come as a surprise to you? Feel free to share your thoughts and experiences on this in the comments below! Stay up to date with Game-Positive and sign up for our newsletter!